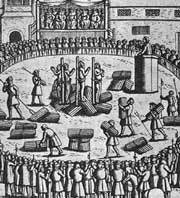 ... 1546, a poet known as Anne Askew was burned at the stake (right) after having been tortured in the Tower of London and condemned for heresy. A year earlier, Askew, an "outspoken Protestant" in her mid-20s, had been called in for questioning at a time when King Henry VIII was endeavoring "to return the English church to a doctrinally Catholic position." She may have been "denounced to the authorities by her estranged husband." Askew's recounting of her 2 interrogations were smuggled out of England and published on the continent; a sampling is here.